Around them, the night sky: resplendent, royally decorated, assemblies of stars stepping forth. For all that though, it is the darkness she feels… Here is the moon — dear, distant companion — yet now intimately near and patient… Since childhood she has always thought of it as William’s moon, as if he had invented it. Certainly she has always felt connected to him by it. Where they were, no matter how far apart, the same moon looked down on them. But all those babies, Lina thinks. Women have to bear the children. And how can they elevate themselves to the level of men when they are forever forced to spread their legs and then attend to the consequences? … She wants — she longs — to convey this strange moment of sympathy… But her mother looks away. Later, as she prepares to leave, Caroline realizes she [Caroline] “has so little power in the world… All she has is her wanting.” It is that fierce wanting, and the fact that she will not end up one of those women who spreads her legs and must bear the consequences (a pox-scarred face being one major reason for a lack of eventual suitors), as well as her intelligence combined with her sense of obligation to and deep love for William that makes her his perfect assistant as he builds ever more powerful telescopes and begins to make discoveries (such as the planet Uranus) that will lead to his becoming one of the most famed astronomers in history. But as she becomes more and more essential to the work, she also starts to realize that her relationship with William isn’t all that balanced, later on using, appropriately enough, astronomical imagery to describe her and William’s best friend’s relationship with William: “They are like two stars in orbit around William’s, she has thought. They circle each other endlessly, but they will never meet.” That friend, Henry, is the main means of financial support for William and perhaps Caroline’s sole hope of male companionship. I won’t say what happens (remember, oh fans of Wikipedia, that The Stargazer’s Sister is a fictionalized account of Caroline’s life). I will say, however, that eventually Caroline does achieve agency, becoming a famed astronomer in her own right, known especially for her discoveries of several comets. Brown is in control of story, structure, and voice throughout The Stargazer’s Sister, beautifully lyrical at the appropriate moments, expansive when needed, intimate when required. The reader shares both Caroline’s feelings of imprisonment and futility as well as her moments of luminous, infinite wonder. I have no doubt many will find the novel “slow,” and that isn’t far off the mark. I’d call it “quiet” and “internal” rather than “slow,” but for many readers that will be a distinction without a difference. It’s also quite highly focused, meaning other characters beyond Caroline aren’t much delved into and what we do see is filtered through Caroline’s eyes and thoughts. That said, a long-time worker of William’s — Stanley — and his friend Henry still come alive as characters. We travel the universe with Caroline, and thanks to Brown’s skill, it’s a captivating, moving trip. The Stargazer’s Sister is highly recommended. Publication date: January 19, 2016. 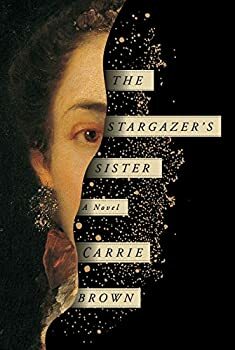 From the acclaimed author of The Last First Day, here is a beautiful new period novel: a nineteenth-century story of female empowerment before its time, based on the life of Caroline Herschel, sister of the great composer and astronomer William Herschel and an astronomer in her own right. This exquisitely imagined novel opens as William rescues Caroline from a life of drudgery in Germany and brings her to England and a world of music making and stargazing. Lina, as Caroline is known, serves as William’s assistant and the captain of his exhilaratingly busy household. William is generous, wise, and charismatic, an obsessive genius whom Lina adores and serves with the fervency of a beloved wife. When William suddenly announces that he will be married, Lina watches her world collapse. With her characteristically elegant prose, Carrie Brown creates from history a compelling story that interweaves familial collaboration and conflict with a haunting exploration of the sublime beauty of astronomy and our small but essential place within a vast and astonishing cosmos. Through Lina’s trials and successes we witness the dawning of an early feminist consciousness—a woman struggling to find her own place among the stars. So, this is a novel, right? I don’t love biographies generally, but the tone and subject matter of this one — especially “highly fictionalized” — captivates. It is a novel. Based in a lot of reality, but she really does make up big things, not just little things. I’ll have to order this!